» #HotSportsTakes: Does Andrew Wiggins Want to Get Rich or Get Better? #HotSportsTakes: Does Andrew Wiggins Want to Get Rich or Get Better? Every now and then, we will attempt to write the worst sports column on earth. Today: Let’s talk about Andrew Wiggins and the choices facing the one-and-done generation. ST. LOUIS — In a perfect world, we wouldn’t be having this conversation. In a perfect world, Andrew Wiggins came to Kansas this year and blew our minds. He scored, he played defense, he dunked, and when March came around, he delivered. He was Carmelo all over again, with a dash of Kevin Durant and maybe even a hint of LeBron. But none of that happened this year. The world ain’t perfect, and neither is Andrew Wiggins. Did you watch the NCAA tournament this weekend? All these diaper dandies crapped the bed. Start with Wiggins. He was on the biggest stage of his life this weekend. The Sunday matinee, the only college game on TV, Jim Nantz announcing. The gold standard. But when the lights came on, the star of the show couldn’t play along with the media’s script. If it’d been a magic show Sunday in St. Louis, the Andrew Wiggins disappearing act would have ended in a standing ovation. But it wasn’t a magic show. It was a basketball game. Wiggins finished with four points, and three fouls, and a whole bunch of frustrated teammates. Rather than put his body on the line for his teammates, Embiid sat back and watched the Jayhawks get bullied without him. Gotta protect that top spot in the mock draft, you know? And Jabari Parker at Duke. Coach K’s motto used to be “My way or the highway,” but lately he’s been handing the keys to more and more superstar freshmen. This year it was Parker who took the wheel. He had ’em humming along for a while, but when it was time to drive to a title, Jabari broke down and the whole team landed in a ditch. It’s not a value judgment. These are just the facts. Parker had 14 points on 4-of-14 shooting, and a proud Blue Devil tradition for the past 30 years was trampled by a 14-seed. When things got bad and Duke needed a leader, Parker couldn’t take them anywhere. He’s got to live with that legacy. You know, unless he wants to change the narrative. Who says these guys can’t do more in college? Wiggins and Embiid and Parker were never quite as amazing as we hoped, but there’s still time on the clock here. You know how they can amaze us for real? Learn the game. Grow. Get better. Come back to campus and decide that NBA millions can wait. I haven’t been in this business forever, but I’ve been here long enough to know that sometimes it pays to say no to all the yes-men telling you to go for the instant gratification. If you wait a little longer and work a little harder, it pays off in more ways that your calculator can count. That, to me, is what the college game is all about. That’s what I want for these kids. It’s not about the NCAA tournament or March Madness or anything else. It’s about what’s best for Andrew Wiggins. 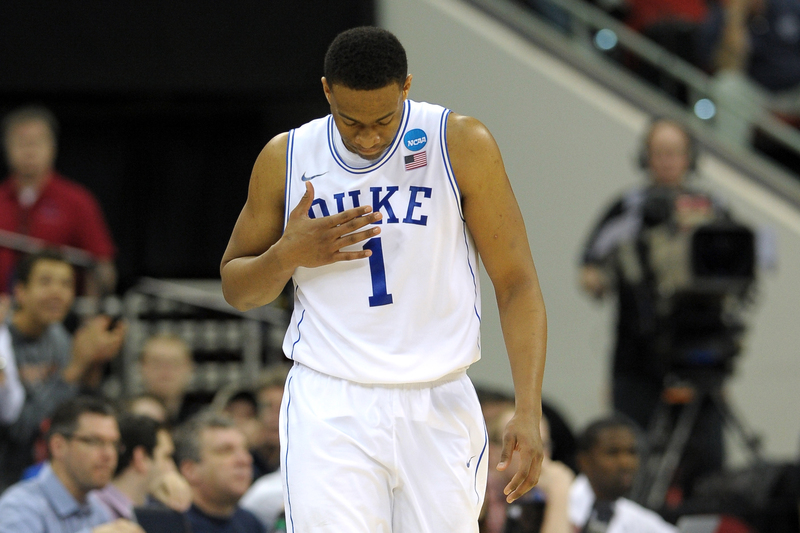 What’s best for Jabari Parker. What’s best for Joel Embiid. Maybe I’m a dinosaur, but when the asteroid hits, I’d rather go to war with a bunch of guys who have the intangibles. Look at it logically. Parker and Wiggins can get paid next year, sure, but they’ll be on crummy teams with no one to teach them how to be a man. No Coach K, no Bill Self. Nobody to teach them how to lead. Their games are incomplete now, but in the NBA, they’ll be playing an 82-game schedule and they’ll have more plane flights than practices. With no time to work, chances are that the holes in their game will stick with ’em for years. As their careers progress, there are some skills they just won’t have, and it’ll cost ’em come contract time. Or if not contracts, maybe it’ll cost ’em championships. It all ends up looking like the marshmallow test for a bunch of 19-year-old superstars. Do you want one marshmallow now, or two marshmallows and a title later on? But I don’t want these kids to get burned. It’s a strange feeling for me. All year long I’ve been upset watching Parker and Wiggins turn the college game into an AAU-fest, but something about this weekend made me feel differently. After a year of wishing they’d never come to college in the first place, now I want them to stay. Not for me or college basketball, but for them. For their families. Watching them struggle struck a chord with me, because that’s how their whole career could look if they’re not careful. They were kids out there this weekend. Boys who were lost and in over their head. If I could sit down with Parker, Embiid, and Wiggins, the one thing I would tell them is that not every lost boy turns into Peter Pan. This world has more cautionary tales than fairy tales. That’s why it’s so important to put yourself in the best position to succeed. If you want to be great, there’s no magic to make it happen. It takes time in the gym and in the classroom, a couple of years of buying into what men like Coach K and Self are selling. That’s what I want for the kids out there right now. Get an education on and off the court. Leave a legacy better than what we saw this weekend. Actually Andrew, you didn’t play well at all. Stay in school a little longer, and maybe next year you can get it right.